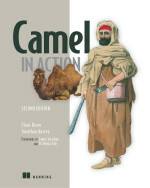 We are moving forward with the Camel in Action 2nd edition book. Manning just informed us that they have moved the book into production phase. All chapters and appendixes except for Ch21 have now completed the copyedit and review cycle and have moved into the proofreading and indexing stages of production. The proofing is done by a professional, whom has not seen the material before (new fresh set of eyes). Once the proofreading and indexing stages are complete, the final Word manuscript chapters will be sent on to the typesetter for layout, along with prepped graphics from the illustrator. When we react this stage Jonathan and myself have chances to review PDFs of the formatted book pages, to ensure all the code examples are formatted correctly and so on. At present time Jonathan and I are now working on the front matter, and writing our preface and what else. We are also reaching out to the foreword writers to ensure they hand in their material (Gregor Hohpe and James Strachan are yet to return their forewords). And when Henryk Konsek has provided his updates, then chapter 21 can move along and also be part of the book. So it starts to look really good and we can start to see the finish line. Its been a long run this time which has taken us almost double the time to complete the 2nd edition than what we did for the 1st edition. But that is possible expected, we are getting older, and the book is also almost twice the size. I just want to spread the word that Bennet Schulz yesterday posted a great short blog how to get started with Apache Camel with just Java. It shows you the basics of creating a new Camel project and with your first Camel route and how to run that with just plain Java. The blog is very good and I recommend new users to Apache Camel to read it, its short and a 5 minute read. I have just been confirmed for attending and speaking at another Javagruppen event which takes place on October 11th from 16:30 to 19:00 in Aarhus Denmark. The event is a "Gå Hjem Møde" which means it starts towards the end of the work day. We have two speakers. At first Helge Tesgaard will talk about getting started with highly available Kubernetes cluster. Then I follow up with my talk about agile integration with Apache Camel on Kubernetes. After the event, then you are welcome to join for a coffee, beer or drink where some of us will head to the city to catch a few before heading home. You can find more details about the event and how to register to attend. My talk at the Melbourne Kubernetes User Group was recorded and posted online on YouTube. I want to say thanks to Ben Griffin and Des Drury for organising this event and recording the talk.